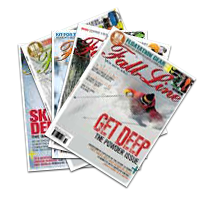 » Telemark Technique Tips » Drills - Improve Your Telemark Skiing in the Steeps » As Featured in Fall Line Magazine. Steep skiing takes practice, unfortunately throwing yourself down the steepest slope you can find isn’t necessarily the best practice. Like skiing moguls, it’s important to set an achievable task. In an ideal world you should challenge yourself safely and progressively by incrementally increasing difficulty, however, finding steep terrain to achieve this is tricky, to say the least. This is where drills come in. Drills are an excellent way to isolate and challenge specific skills or attributes in a safe environment, in preparation for the real thing. To telemark steeps you need to be brave mentally, you need a good range of tactics to deal with the terrain, you need timing and coordination, and you definitely need strength and balance, without strength and balance you’re in real trouble. Here’s a drill that will develop strength and balance, fine tuning them for the steeps - ‘The Heels Up’ drill. Start on easy terrain, in a straight run, lift both heels so that you’re balanced on your tip toes, actually you’ll be balancing on the balls of your feet but depending on your binding, it’ll feel like your tip toes. Both shins should be parallel to the snow, and knee to shoulder a straight line (no breaking at the waist). Once you feel comfortable in a straight run, it’s time to try some turns. Once again, choose easy terrain. Turning while in the ‘Heels Up’ position is great for reducing excessive rotary movements. The moment you turn something sharply, you’ll undoubtedly lose balance. Rotation should come from the upper and lower body simultaneously, in a slow controlled manner. It’s essential to have a solid core to stay balanced in this position, pull your belly button to your spine while remaining extended at the hip, in other words - not flexed. Having your hands in front but relaxed (goalkeepeer ready to save a penalty) will help your upper body management and therefore your balance. Feet should be hip-width apart giving a stable platform. A strong posterior chain is essential for this drill, especially glutes, hamstrings and lower back. If you use a Swiss Ball at the gym, then kneeling on the ball feels very similar to the ‘Heels Up’ drill. Engage the glutes, drive the hips forward and you’ll find your balance point. It’s essential to have accurate lateral balance to control the edge change. Remain stacked over the skis at all times, take your time to feel the skis go flat before inclining the body slowly to engage the new edges. Lateral balance is also essential to maintain pressure control over the outside ski. Even if you incline slowly but excessively, you’ll feel the outside ski slowly drift away and you’ll lose balance on your tip toes. Focus on keeping the shoulders as level as possible to reduce excessive lateral inclination.